Most Large Massage and Perfect Chair Orders will have to add 2-3 Business days for Freight Delivery. Times are not guaranteed and larger items such as massage chairs and recliners generally take a little longer. General Shipping Policy - Vitalityweb attempts to ship your order within 24hrs of being placed unless the product is on back order or special order status. Orders placed on weekends or holidays are shipped the following business day. 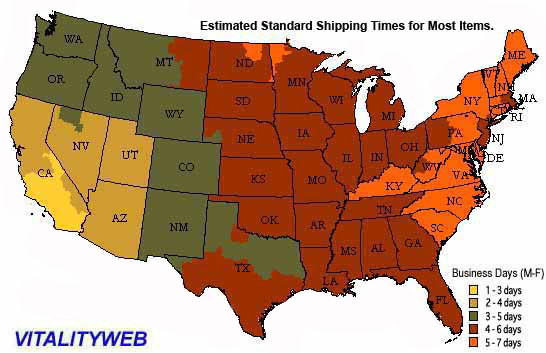 Standard U.S. orders are shipped UPS or FedEx Ground. Express 1-2 Business Day and 2-3 Business Day Delivery is available on most items. International Customers: We do ship most of our products internationally(No Herman Miller Products). Pricing depends on weight and destination. Please e-mail us with the products you are interested in for shipment options and pricing. Any import duty, taxes and/or fees for the import of the product into your country are not included and will be collected on delivery. Other than CANADA we will generally only ship to the local international airport in your country for you to pickup. CANADA CUSTOMERS: Refurbished chairs are shipped under the following code: "CODE SH: 9401.61.90.00 Chair, leather covering, completely refurbished in the United States". Since the chairs are completely Refurbished in the US, this MAY help to decrease or eliminate import tax to Canada. We do not cover import duty, brokerage fees and/or taxes, nor do we know what these fees will be for your order. You will be responsible for any and all of these fees charged by your country on import of your order. We accept Visa, Mastercard, Amex, Discover, PAYPAL, Google Checkout, Money Orders and Money Wires for Canada Orders. . We have to ship to the cardholder at the billing address if using a creidt card for your purchase. PLEASE NOTE: We ship UPS Frieght Ground to CANADA. The import duty / taxes are not included in the prices. SELECT NEW RMS-10, HT-1650, HT-275, HT-7450, HT-7120, HT-5040, HT-5005, HT-2720, HT-2310, HT-5270, HT-2620, HT-5320, HT-5005, HT-140, HT-136, HT-135, HT-125, HT-104, HT-095, Perfect Zero Gravity Chars, Panasonic and Sanyo Massage Chair orders within the continental US will not be charged extra for standard ground shipping or California sales tax. FREE LOCAL WHITE GLOVE DELIVERY SERVICE including the setup of the chair, chair instruction and removal of the packaging materials is FREE for NEW Chairs (as listed above) to most addresses in Los Angeles, Orange, Riverside and San Diego Counties. Please call for your specific area. Outside of our local delivery area, select NEW chairs include Basic Curbside Freight Ground shipping only. White Glove Delivery Service to other areas outside of our local delivery area is $195 for Select New chairs that include free standard shipping. Some Refurbished Massage Chairs and Perfect Chairs do not include shipping or California Sales Tax (California orders Only). White Glove Delivery Service for a Refurbished Chair to most addresses in San Diego County is $75. White Glove Delivery Service for a Refurbished Chair to most addresses in Los Angeles, Orange and Riverside Counties is $155. White Glove Delivery Service for a Factory Refurbished Chair outside of our local delivery area is $295.